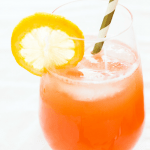 How Easy is Watermelon Lemonade with Honey? Well it couldn’t get much easier to be honest! You throw some cubed watermelon into the blender with some lemon juice, honey and water. Pair it with some ice cubes, and you have a seriously refreshing drink to get you through the afternoon heat. It is quicker to whip some up for yourself than it would be to head to the store and buy the ready-made stuff. Plus it is full of only the good stuff. How could you say no? Variations: swap out the watermelon for some peaches, nectarines or other summer fruit of choice. Add in some mint, basil or thyme for a bit of a flavour twist. Have fun with it, and make it your own! Summer sweet watermelons combine with lemons and honey to make this fantastically refreshing watermelon lemonade with honey. 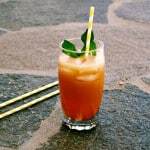 Pair it with some ice and a sprig of mint, and you have a fancy drink to enjoy on the porch on a hot summers day. When ever í take watermelon and honey í feel grate with ma working stick, and it get biger and stronger,i love it. Nice and good for this summer. I have never been a lemonade fan, but I love lemons. I just find that lemonade is always way too sweet for me. This however sounds totally delicious. Love watermelon, and using honey is great. Perfect for these hot summer days. That’s exactly what I need on these blazing hot summer days. Thanks for the recipe! That looks so refreshing. I can’t drink at the moment, so this looks like a great alternative for the summer. I love everything about this! 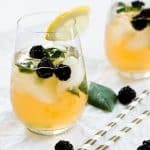 What an amazing drink to cool down with on a hot summer day! .. excellent!! Oh thank you Heather 🙂 We love it! This sounds so refreshing!!! I would personally use stevia as a sweetener ’cause my body doesn’t really like honey. But my boys would love the honey version! Pinning!